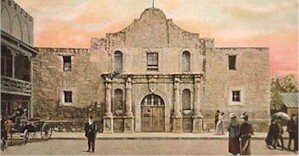 Click Here for Ghosts of the Alamo! 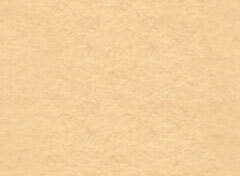 Ghost Books on the History & Haunts of the Military, the Civil War & Old West! Special Feature from Author Dave Goodwin in Iraq! Click Here for this Chilling Story! 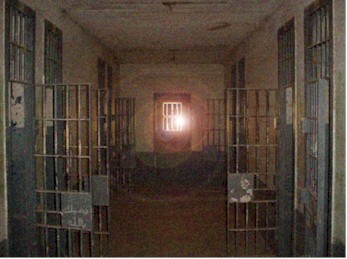 The creator of the Military Ghosts Website offers a new article on the Hauntings of the Infamous Abu Ghraib Prison in Baghdad! Military Ghost Books by David Goodwin! 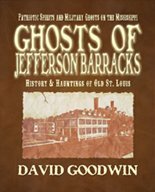 Ghosts of Jefferson Barracks -- The History & Hauntings of the Oldest Military Post West of the Mississippi River! Journey Back in time to Old St. Louis & Discover how the History of this Old Post has Created the Hauntings of Today! Click Here to Order Your Copy! This original military post was founded in St. Louis in 1805 and served as a garrison and an trading post with the Indians. Later abandoned after Jefferson Barracks was established, the grand staircase that was built by the WPA at the former post began to be regarded as haunted. As the oldest continuously operating military post west of the Mississippi River, Jefferson Barracks has seen more than its share of history over the years. Not surprisingly, the decades of events have left an impression behind and the post is known as one of the most haunted military sites in America! The historic St. Louis Arsenal took center stage as violence in the city escalated during the Civil War. Although the building no longer serves as it once did, stories have been told over the years of the mysterious "Blue Man", a shadowy ghost that now haunts the Arsenal. The strange tales of this Missouri military post revolve around a small town called "Bloodland" that was swallowed up by the base many years ago. Through the years, the ghosts of former occupants of the town have been involved in all manner of questionable behavior. This legendary fort fell to Federal forces at Savannah during the Civil War and the history of the place tell of a phantom cat who was a mascot of sorts for the Confederates who manned the guns here. This phantom feline may have even more than nine lives! Made famous in the film Glory, Fort Pulaski saw fierce fighting and amazing bravery during the Civil War. Over the years, it has become known for the variety of hauntings that occur here, including the very interactive presence of a "commanding" ghost. This Texas post was established back in 1867 to protect the frontier settlements & to patrol the vast reaches of the Texas wilderness. Although closed down after only 22 years, many of the officers and soldiers here continue to do their duty from beyond the grave! This Texas fort, near Presidio, was originally founded back in 1848 by Ben Leaton, a scalp hunter for the Mexican government -- it is a place of legend, deaths, dark secrets, lost treasure and not surprisingly, a few ghosts. Discover the mysterious legacy of this historic site. Located in the south-central part of Oklahoma are the ruins of Fort Washita. The fort was established in 1841 and was abandoned to Confederate forces in 1861. Sometime between those years, a murder took place which may have given the fort its resident ghost -- or at least one of them. The ruins and rebuilt barracks are still said to be haunted today by this restless spirit, the ghost of a headless woman who has been dubbed "Aunt Jane". Do the Dead Still Walk in Illinois? One of the greatest ghostly legends of southern Illinois is that of the Phantom Funeral Procession of Fort de Chartres, the ruined French & British outpost. One certain dates a select group of people are believed to see the funeral walk once more. Find out who & when!